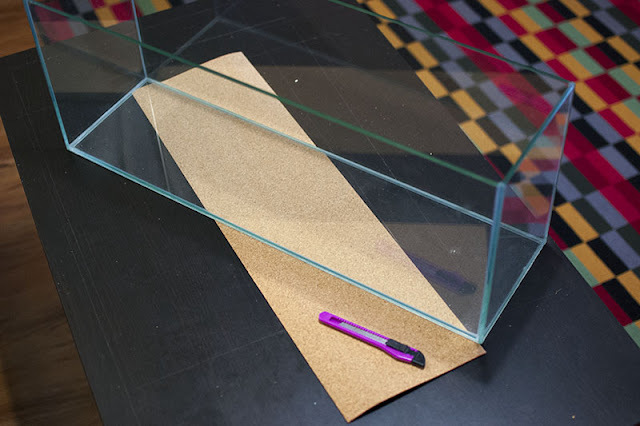 This project starts, as you might expect, with aquariums. I plan on making several modifications to my set of four 6.5g tanks, and the first is to drill holes for the plumbing that will eventually connect the tanks. Drilled holes are generally reserved for large tanks due to the inconvenience and complexity they introduce, but I'm looking to have some fun. 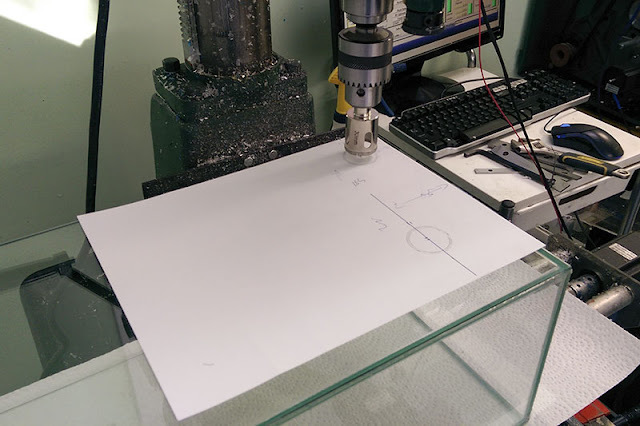 The hole positions are not particularly critical so I drew a paper template by hand and aligned the drill by eye. 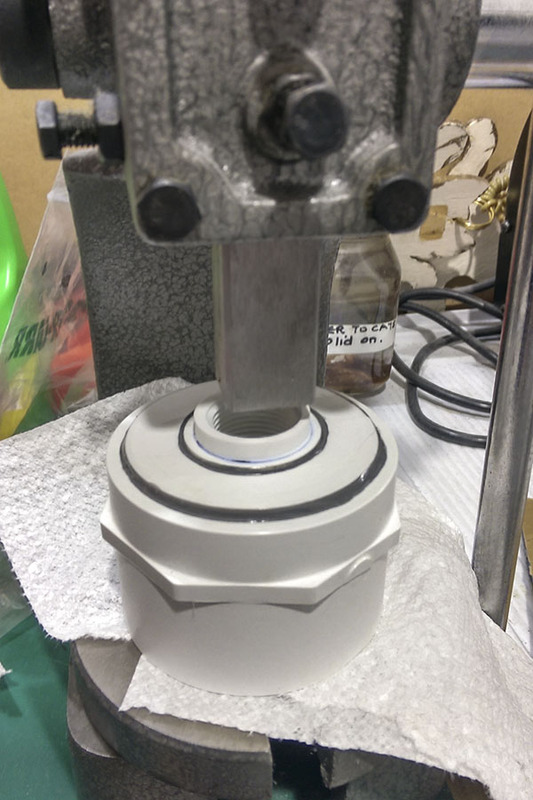 Drilling glass has a temperamental reputation, but I found that a drill press made it almost effortless. The biggest challenges when drilling by hand are starting the hole and keeping the bit square - not a problem for a drill press. 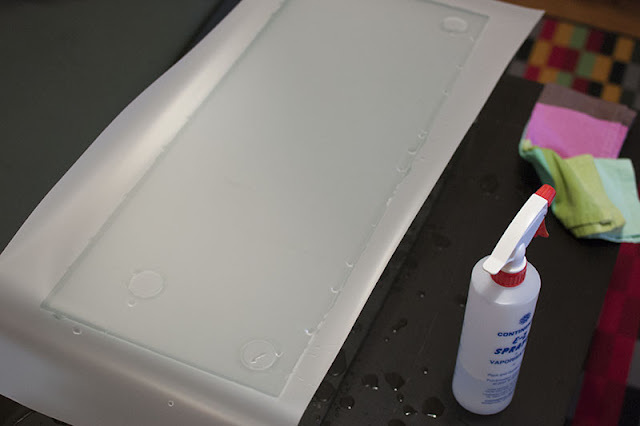 I used the old trick of building a small pool of water with sticky tack to keep the cut cool. The disk of glass will fall and smash against the far side of the aquarium when it finally breaks free, so I was careful to place a wad of paper towel to catch it. I cut a total of nine holes in three tanks, leaving a fourth tank unmodified. 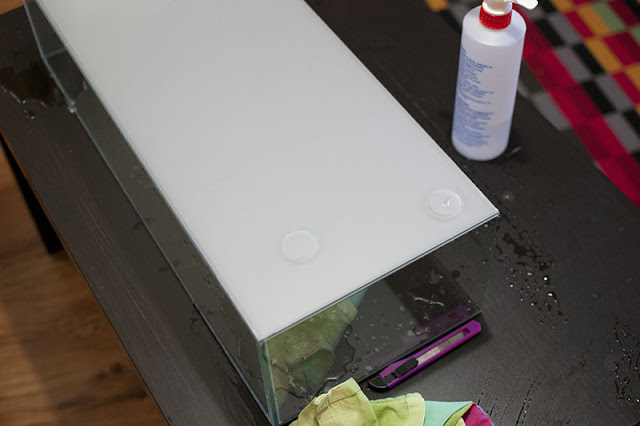 Placing an aquarium directly on a hard surface can be dangerous if it is not perfectly flat, so a layer of foam or cork is often used to spread the load. I prefer the aesthetics of cork, and it only takes a few seconds to cut matching rectangles if you trim around the edges of the tank. Next I applied window film to the back of each tank. This process is straightforward, but it can be difficult to get a perfect dust and bubble free application. I pushed all the imperfections downwards so they will be hidden when the tanks are filled. I am using a frosted film for the three drilled display tanks to give them a brighter feel. The edges and holes can be easily trimmed with a knife. 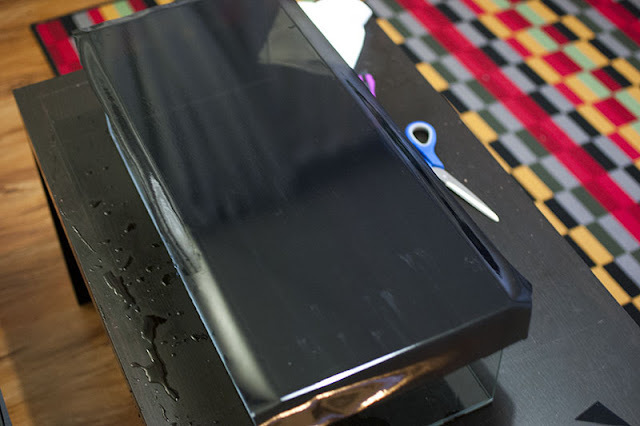 I chose to use a dark black tint for the fourth aquarium. 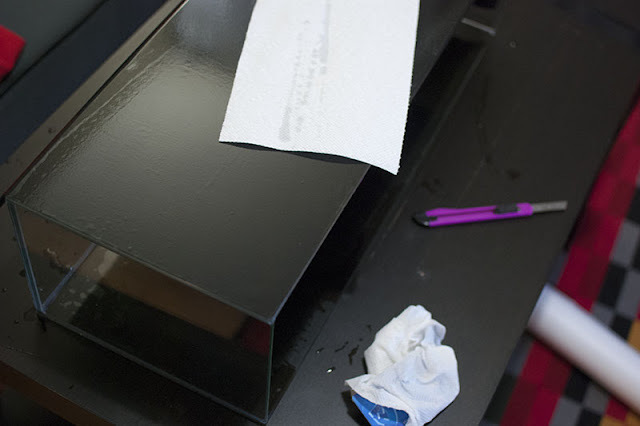 The black film is not fully opaque so I needed to apply two layers. This finally gives us a peek at the goal of this project. The top three tanks will be used for display and contain no equipment. The bottom tank will house enough filtration and equipment to support all four tanks, and may also contain a small display area if space permits. I wanted to preserve the clean look of my rimless tanks by hanging the lights from the bookshelf. This is a perfect application for 3d printing, so I drew up a minimalist design in CAD and was rewarded with a tray of plastic parts. 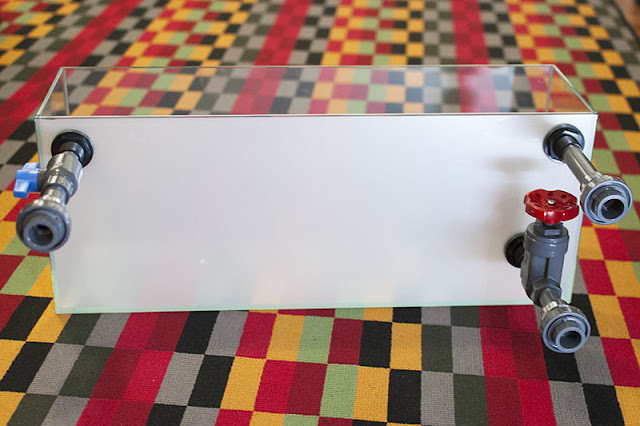 Both sides of the light mounts clip onto their matching surfaces. 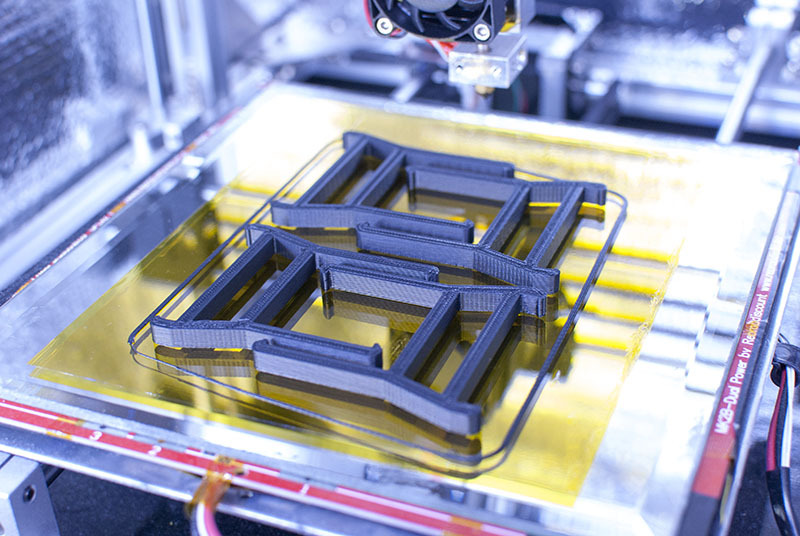 It took a few test-prints to get a tight fit, but the result is quite nice. 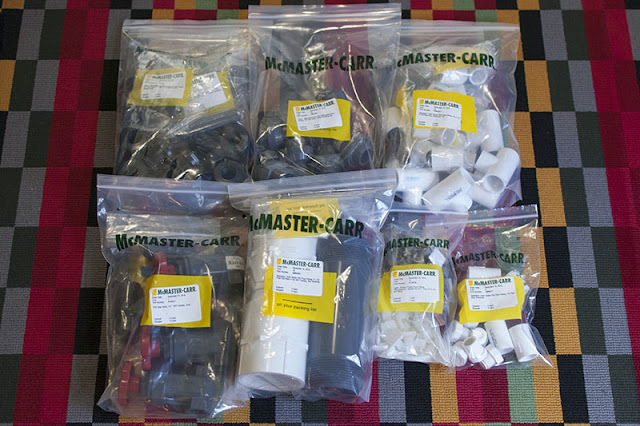 The plumbing fittings were all ordered from McMaster-Carr. Some of them could have been acquired locally, but I also needed some pretty niche stuff and the convenience of getting everything from one source far outweighed the additional cost. The costs add up, but on a per-tank basis it isn't so bad. The complete system will have roughly 90 connections including bulkheads. 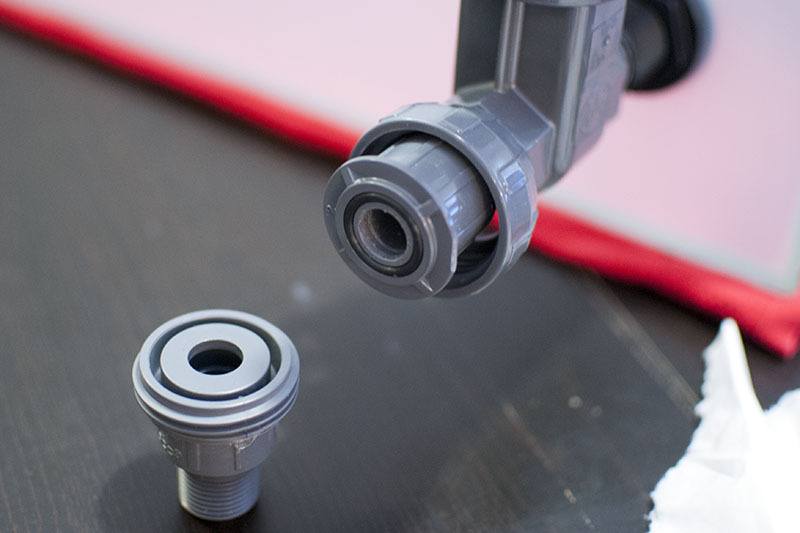 It is important that every joint is fully seated and the threaded connections have consistent engagement or the plumbing won't line up between shelves. I started by performing a loose dry-fit just to make sure the plumbing does not interfere with the bookshelf. The cross-brace at the back comes close but should not be a problem. The answer is that simply pouring a mix of water and air down a four foot long tube is noisy. 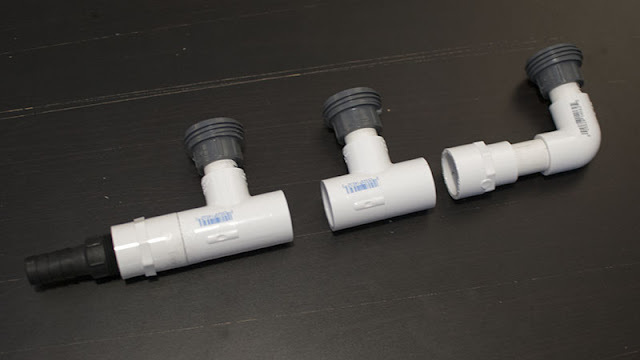 The simplest aquarium plumbing arrangements will sound something like three toilets flushing perpetually in my living room. 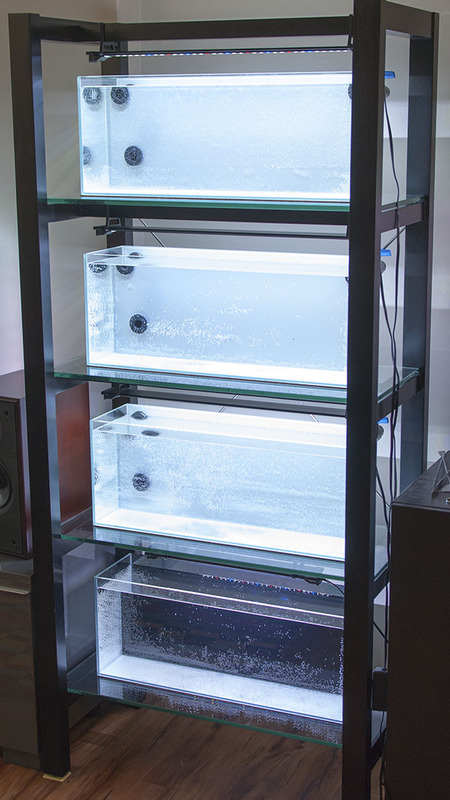 Luckily there are several clever options for completely silent aquarium overflows, and I have chosen to borrow the Herbie design. The idea behind a Herbie overflow is that if no air can enter the drain there will be no noise. 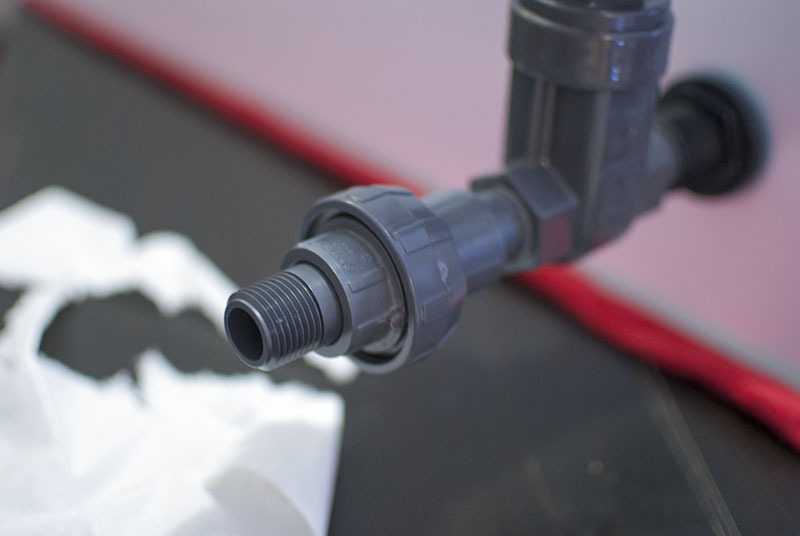 By restricting flow on the main drain we ensure it stays below the waterline. 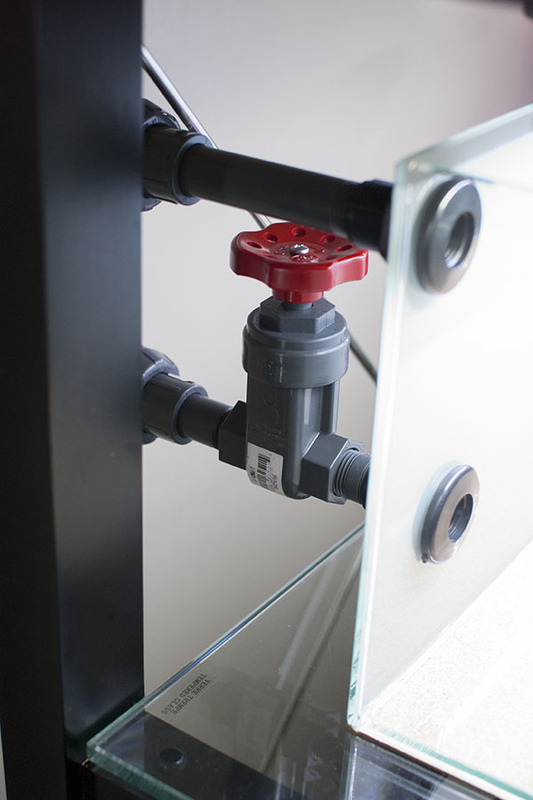 The emergency line provides a margin of safety as it would be impossible to perfectly tune a single pipe to always be below water-level. 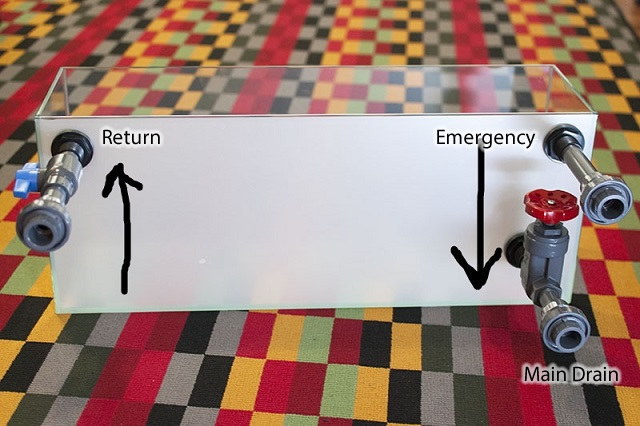 When properly adjusted, one return line should carry only water and therefore be silent; while the other line carries only a slight trickle of water which can adhere to the side of the pipe and makes no noise. 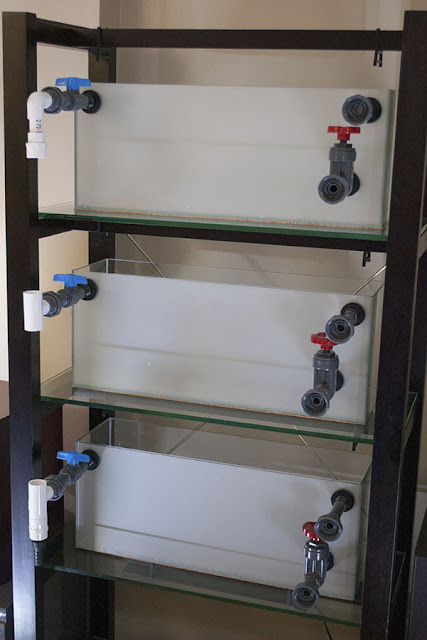 After preparing all the tanks I closed the valves and filled the tanks to weight test the bookshelf. Failure of the bookshelf is by far the most catastrophic way this project can go wrong. I consider collapse unlikely, but it would be extremely costly which does make me nervous. Aquariums are typically too heavy for standard furniture, but my tanks are quite small and actually weigh no more than a typical 30" shelf of hard-cover books. I also plan on anchoring the bookshelf to the wall which should make it more stable. 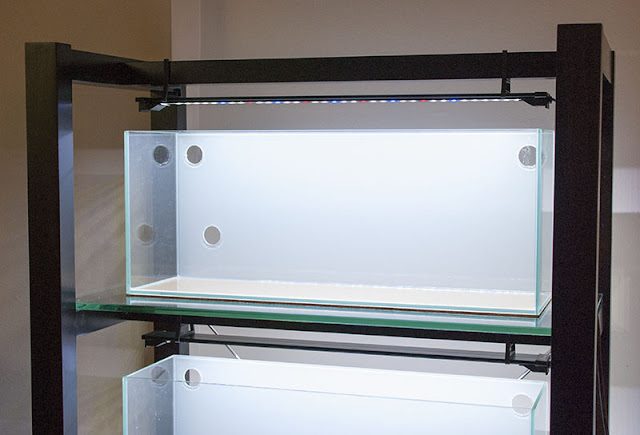 You can of course set up an aquarium with off-the-shelf equipment, but I have some fairly particular size and aesthetic requirements and will be making or modifying many parts myself. 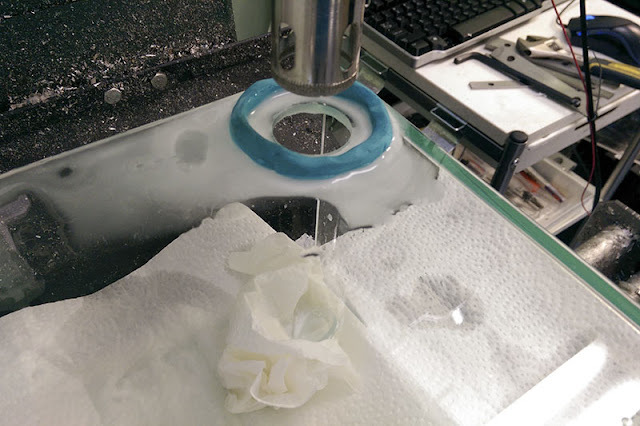 Here I am turning down some PVC fittings to build a reactor. A reactor is an optional device that helps dissolve CO2 gas into the water to improve plant health. 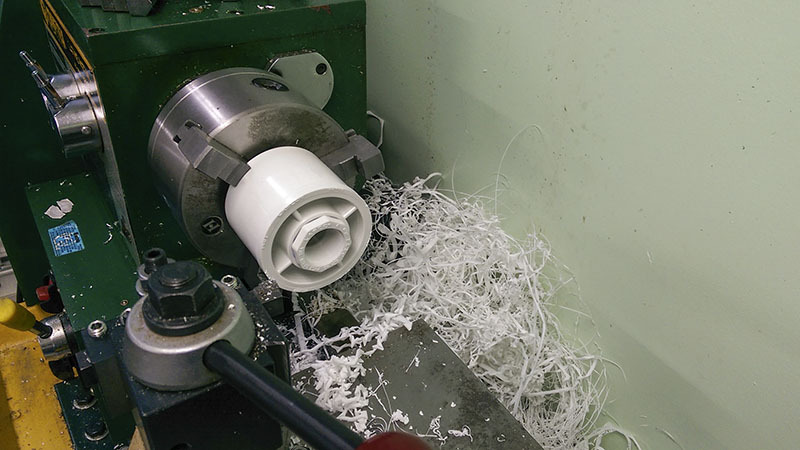 Some of the large diameter fittings can be tricky to combine by hand so I cheated and used an arbor press to seat the components. 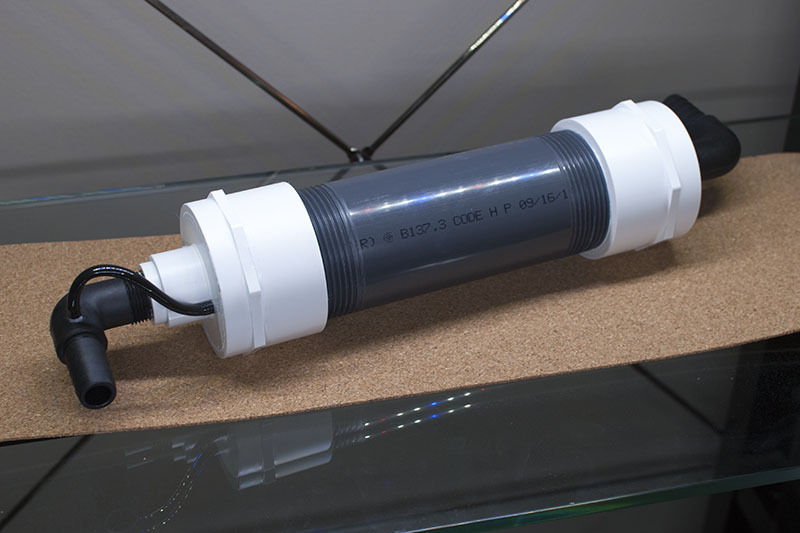 Elbow barbs were installed in the finished endcaps so that the reactor can be connected to the rest of the system. Finally the caps are attached to a short threaded section of tubing, completing the reactor. Afterwards I emptied the tanks and prepared to permanently install the plumbing. 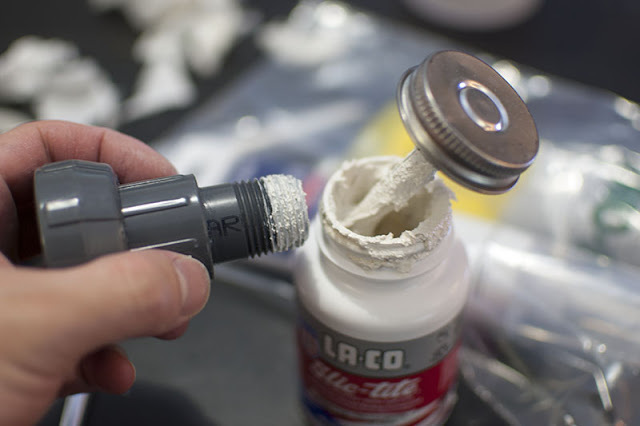 I'd been reading a lot about how to reliably work with threaded PVC connections and it seemed like sealant is recommended over tape. I was careful with how much torque I applied to the connections. 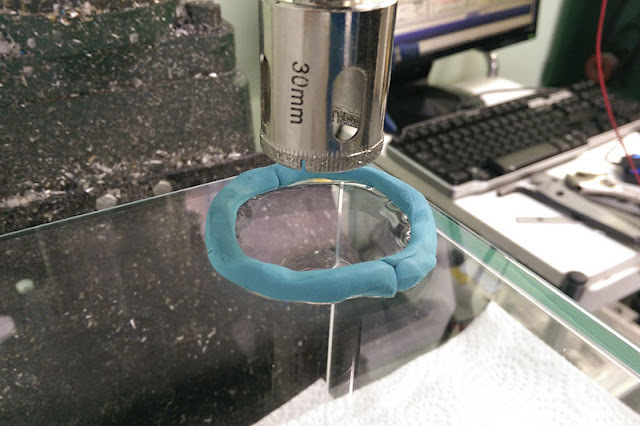 They must be tightened enough to be watertight, but it is deceptively easy to crack the small plastic fittings by going too far. 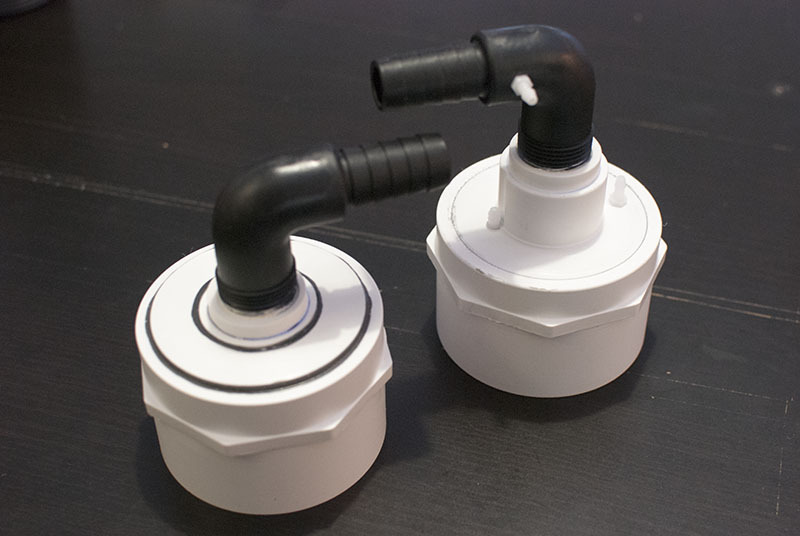 The tanks will be connected to the drain/return lines via PVC unions. Unions are designed to be easy to disconnect, they can be attached at any angle and use an o-ring to ensure a watertight seal. 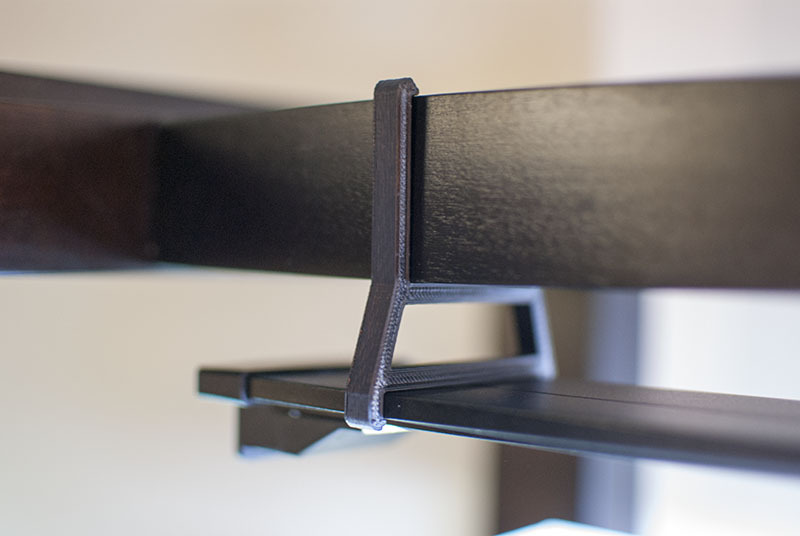 The other side of the unions will connect the three shelves together using a mix of tee and elbow joints. 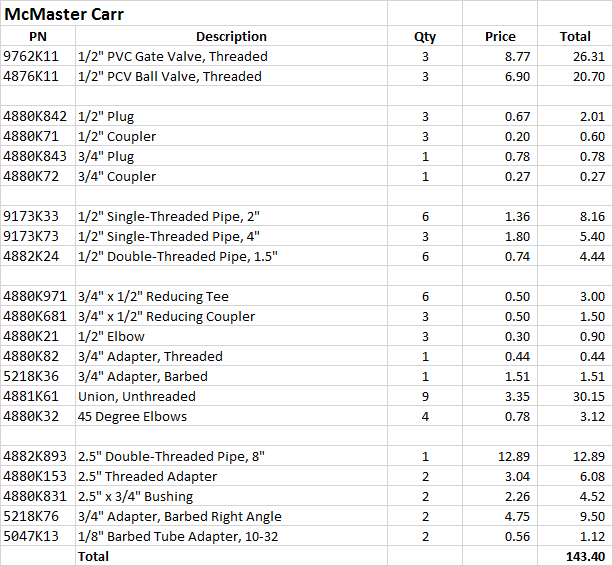 I will be making three of these assemblies in total, one for each set of holes. Its easier to visualize how the union assemblies will look when they are mounted to the tanks. 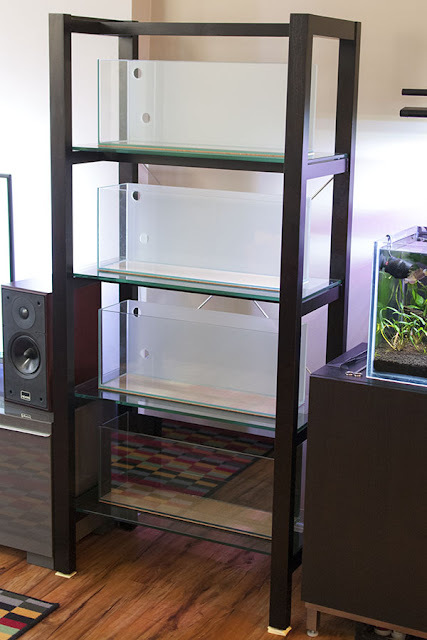 I placed the aquariums on the bookshelf backwards to make them easier to work with for now. The tanks and bookshelf look quite nice already, but there is still more work to be done before they can be connected together. 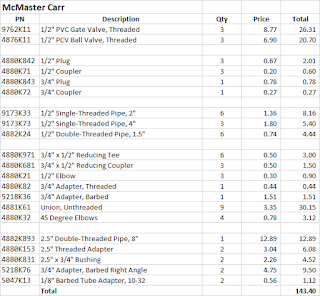 I'll finish the plumbing and even start a few new tasks in the next post.